....can help you decorate your home! If you read the "about me" section of my blog, you will see that I pretty much like it all, but I need to find an underlying cohesiveness that will pull the new house together. I've always said that a house will tell you how it wants to be decorated and I fully believe that. Our previous homes have been decorated in shabby chic, clean line contemporary and somewhat minimalist. Since I plan on living in this house for more than 2 years, I want it to be more of a comfy, cozy home, rather than just a place we are going to temporarily live in and decorate. As you all know, an Idea or Inspiration Board is a collection of images that will help you visually organize your ideas for decorating a space. It also provides inspiration (guess that's why it's called an Inspiration Board, huh?) and guides you so that your project is more cohesive. With that being said, I decided to pull together an Inspiration Board to help me make a few decisions about how I want to decorate each room of the new house. In hindsight, I should have used an Inspiration Board long ago. You would think that I would have since I'm severely OCD and try to be uber organized and I hate clutter and disorganization, and, and, and. I shared with you a few weeks ago what one of the first projects will be in our new home....tackling this boring half bath. I also shared with you a bathroom Inspiration Board I found that I really liked. 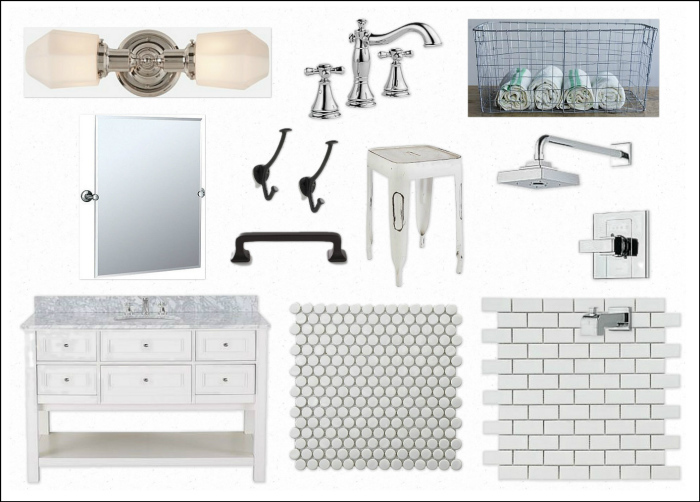 After discussions with the hubster, and some lengthy window shopping, I've finally pulled together my personal board for decorating this bathroom. The hubster nixed any tile work for the half bath. While I love the tile, it isn't necessary for the half bath. So I will save my "changing his mind" efforts for the master bath and go with the board and batten style that I love so much. It is a small space and this will give the walls some visual interest. The only decision left to make about the wall is what the color will be above the board and batten. I liked the peppercorn, but the hubster said it is much too dark for a space with no windows. I also really like the other two lighter colors and will have to make a decision between the two, but odds are currently with the sea salt. It is a nice calming color that will compliment the wall color in the hallway. 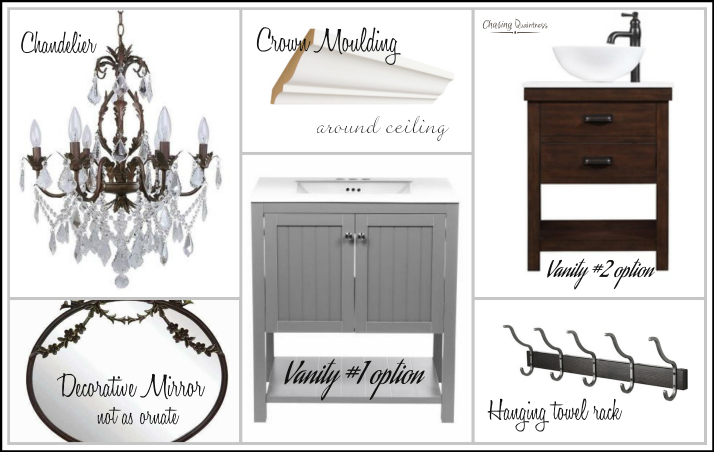 I'm not sure yet on whether to go with the gray vanity or a white vanity (the brown was out, but I didn't want to go back and redo this board). I believe the white will be too much white, since the board and batten will be white. 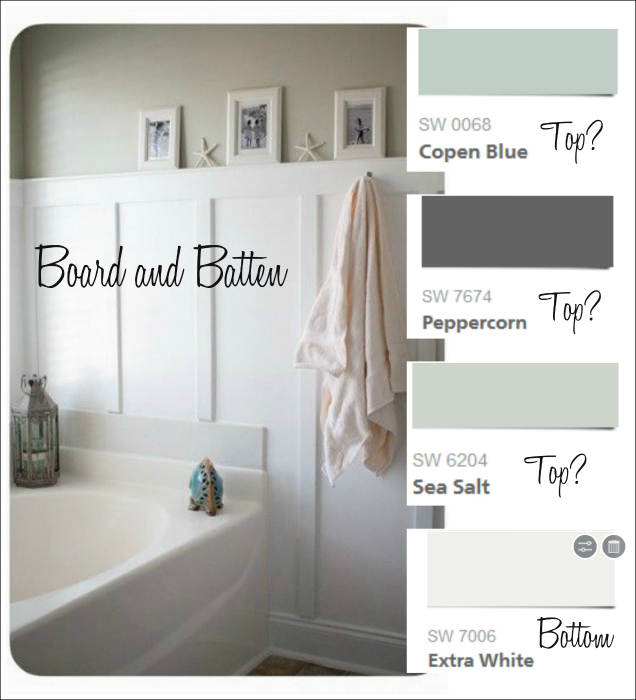 The gray will be a nice shift in color and blend with the color above the board and batten. I really want a chandelier in this bathroom, however, the current light fixture is mounted on the wall above the mirror. I explained to the hubster that all we had to do was use one of those swing chain thingies and find a pretty ceiling whatchamahickie to cover the place on the wall. Don't you love my technical speak? The hubster's eyes glaze over and he totally checks out of the conversation when I don't have proper terms for stuff. That requires me leading him by his nose hand down the aisle at Lowes so that I can show him what I'm talking about. .....while on one of her shopping sprees. Unfortunately, she lives too far away for me to buy it from her. But it really would go perfectly in this space. I want to add crown molding in this bathroom, but I'm unsure since the room is so small and we will be adding the board and batten. I don't want it to be too much wood. ....so I will wait to see how it all looks once we have finished adding the new fixtures paint and board/batten. You've got some great ideas. Bathrooms are hard, in my mind, because they aren't huge but you want them to be special. I'll be watching to see what you do. Decisions, decisions.... That's the joy (and pain) of decorating, right? But you've got some great inspiration pieces and photos. I can't wait to see how it turns out. I love all your ideas! 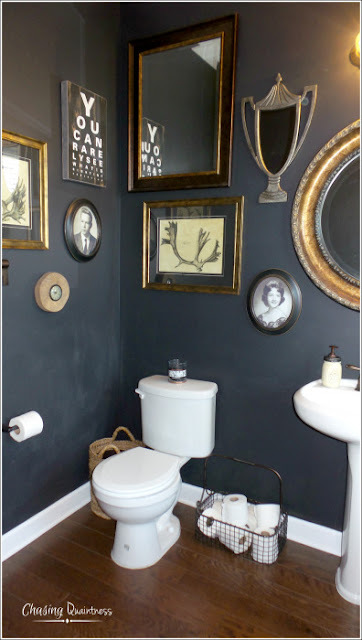 I adore drama in decorating, I have a small dark red bathroom with no windows and it's super charming, so I can see your attraction to that peppercorn color. That would be striking against all that crisp white wood. Of course, so would the blues, very nautical. Can't wait to see what you choose!! You got this girl! These ideas are fabulous. I know you will make it sooooooo pretty and comfy and cozy. I cannot wait to see what you do. Have you heard anymore about the buying of the house? Yes ma'am. The realtor called yesterday to schedule our appointment for Monday. They have not heard back from the lender, so that appointment is tentative. wondering if wallpaper is out of the question above the board and batten? A really kicky pattern would liven it up and make pictures unnecessary. I've been seeing that wallpaper is making a come back. Otherwise, I would love to see that peppercorn! Seems all the white would make it not so dark. I love wallpaper and picked out a few options for this room, but the hubster says no way, no how. We want to live through the moving and first remodeling project, so we are going to go with paint….LOL. I think I’ve got him convinced that peppercorn is the right choice for this bathroom. :-) And the chandelier will add more light as well! It is going to be perfectly charming, warm, welcoming and wonderful! I am working on some mood boards too! Thank you so much Jemma! Oh, I can't wait to see what you are working on...I'm so excited for you! I'm finding that I'm totally addicted to creating these inspirations boards...LOL. I'm starting to work on one for every room! The hubster is REALLY going to love me! :-) Hugs!! You have some great ideas. I am excited to follow along as you decide what to do. Great ideas! I know whose mirror that is and she is too far away! Can't wait to see what you do. Thank you ma’am! I do wish she lived closer because that mirror is perfect! :-) I’ve seen a few on Craigslist but am waiting until we close to make any purchases. It is going to be so pretty, Benita! 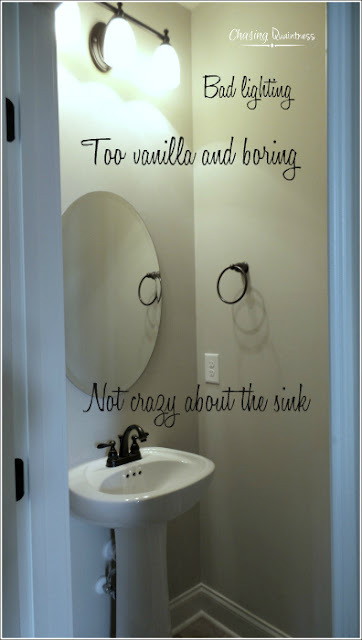 I love the sea salt color, and a mirror similar to the one you show would be perfect there. I know that glazed eye look you wrote about! Oh I hope the appointment Monday does happen. I love sea salt, and used it in our bathroom re-do. It can read blue or it can read green depending on the lighting, etc. It goes really good with brown! I love all the ideas you have, it will look beautiful! Thank you ma’am! I’m trying really hard to incorporate new and rustic styles, but I really do like all the “new” stuff…LOL. Hugs!!! 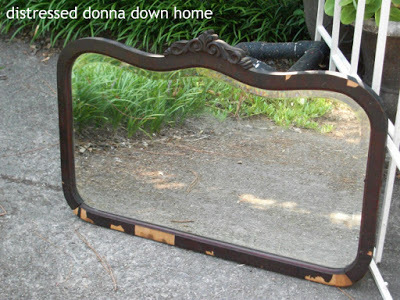 Yes, my mirror would be perfect if I ever get her to stop losing her veneer. I am leaning towards painting her. Do you agree? love the idea of a gallery wall! 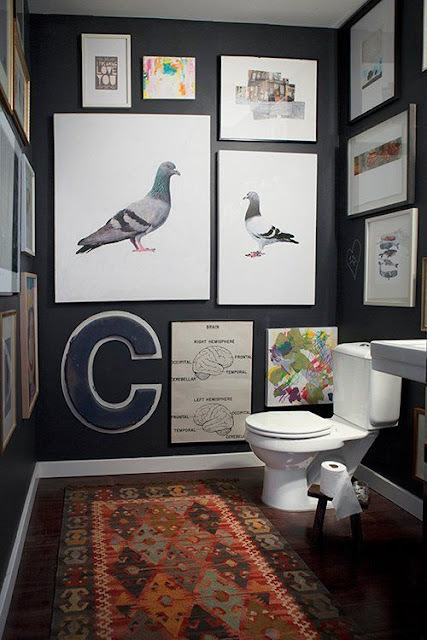 My powder room is navy blue and had the beginnings of a gallery wall. Sorry for the late comments friend, I'm sure you've moved on from this bathroom. I started teaching for the semester and haven't been free to check in daily 😔. Honey, no need to apologize at all! I’m doing all I can to try to post a blog, unpack boxes and read blogs….so I know exactly how it is when you have your hands full. School is way more important and friends understand this stuff! I’m just ready to get started on the bathroom, but we have to wait a couple of weeks. Since this will be the first “remodel” in the house, it is front and center on my list! :-) I bet the navy is gorgeous!! What photos did you use for the gallery wall? I think I’m going with the peppercorn! ;-) I really like the idea of the dark color with the white contrast. I used a combination of paintings. Some were DIY, but most are paintings I've purchased. One of the paintings is my favorite Eiffel Tower painting. Writing this makes me realize that I think I may have a different country depicted in every room in my house LOL.